A good way to determine if meat is cooked through properly is by using a thermometer. There are a lot of different types of thermometers. The one you use to take your own temperature when you are sick is NEVER used for taking the temperature of food. In fact there are very specific thermometers used for making candy/deep frying food and testing meat. …you insert the instant read thermometer and it will give you an instant reading of the internal temperature. … and then put it in the oven. 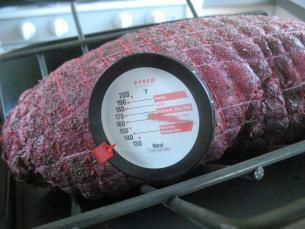 You leave the thermometer stuck in the meat, in the oven, during the entire cooking process. The dial indicates what the internal temperature is. 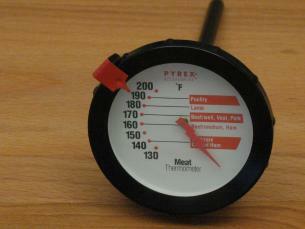 These thermometers will also tell you what the correct temperature should be for doneness of poultry, lamb, and beef. These thermometers are usually sold at the grocery store and cost less then $10. 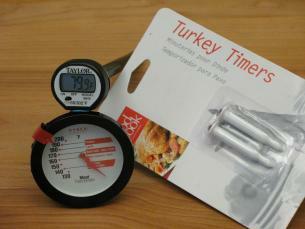 Many stores sell chickens and turkeys that come with a thermometer already stuck in it. When it pops up, the meat is cooked. You can also buy these little white pop-up thermometers just on there own at the grocery store. They are inexpensive and convenient but they are for one time use only, then you have to throw them away. All three types work well. Which one you choose to purchase depends on your budget and how much meat you plan on cooking!